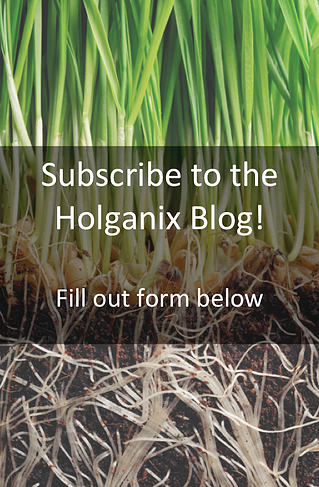 How does Holganix's slow release fertilizer work? Slow release nitrogen fertilizer products are designed to slowly melt away layers of nitrogen, releasing a steady stream of active ingredients. You can think of them as acting similar to time release medications for human health. The goal is to ensure more uniform grass growth with less nitrogen loss due to leaching and decreased contact burn potential. This is especially important during the warm summer months when quick-release nitrogen fertilizers can amoniate and potentially burn turf and plants. 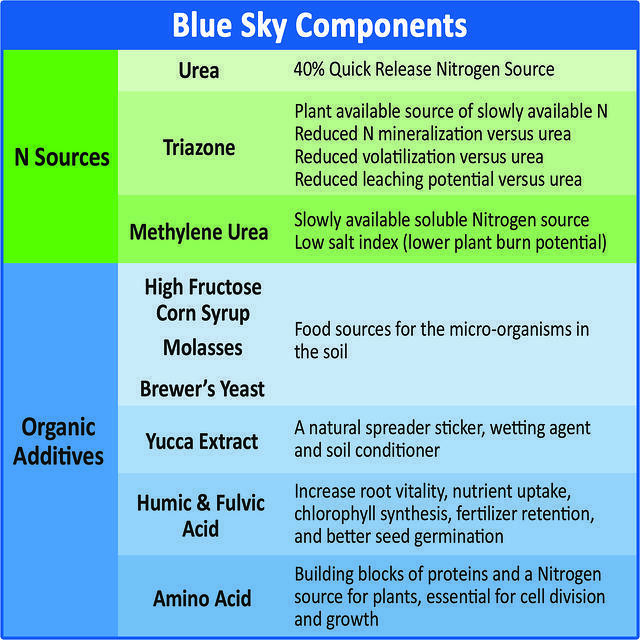 Like other Holganix products, Blue Sky 21-0-0 works with the soil food web to contribute to soil health. The recipe combines 60% slow release nitrogen (triazone and methylene urea) and 40% quick-release urea nitrogen sources with imperative biological food sources and organic additives. The biological food sources and organic additives include: High Fructose Corn Syrup, Molasses, Brewer's Yeast, Yucca Extract, Humic and Fulvic Acid and Amino Acid. This combination recipe allows for the optimum usage of the nitrogen while also activating the soil biology by providing food sources or supporting the soil microorganisms. This balanced approach: quick-release nitrogen, slow-release nitrogen and additional food sources optimizes the soil food web by making nutrients available to the plant as need. When Blue Sky is applied your turf experiences a quick green up with less surge growth, while also improving productivity of the soil ecosystem. When Blue Sky is combined with Holganix liquid concentrate, living, beneficial biology is added to the mix and rates of Blue Sky can be reduced while receiving optimal results.